Chop the first 4 ingredients and place them in a food processor and blend. Add artichoke hearts and blend. Next add the garlic, cheese, softened butter, salt and pepper to the food processor and mix until smooth. Slice the bread in 1-inch slices, stopping before the base of the bread. Stuff the bread with the mixture. Wrap the bread in foil and bake for 25 minutes. Serve hot. 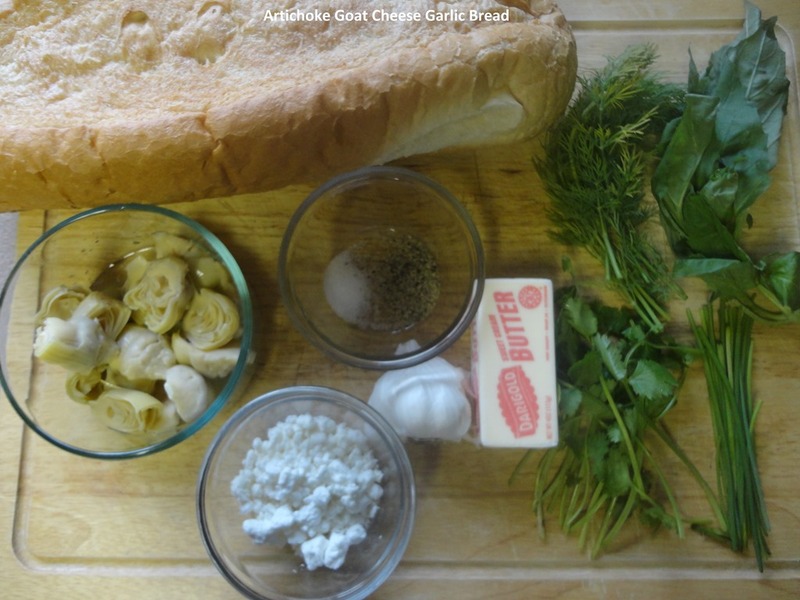 View our video of Artichoke Goat Cheese Garlic Bread. The video is principle to demonstrate how to make the Artichoke/Goat cheese bread. But a main dish “Rosemary Chicken and Sundried Tomatoes with Linguini” is shown. Click here to view the recipe. This entry was posted in Side Dish and tagged Artichoke, Bread, Cheese, Feta, Food processor, Garlic, List of Italian dishes, Sun-dried tomato. Bookmark the permalink.